The rider, with hair dressed in a double topknot, wears a long tunic worn off the right shoulder to free the rider's raised right arm while swinging the mallet, with the body bent slightly to the side and the head positioned to follow the ball. The horse is shown in full gallop with head pulled to the left and mouth open, and is glazed in chestnut with a green saddle and touches of white glaze on the hooves, forelocks, mane, face and tail. Provenance: The Property of Lady Mitchell; Sotheby's London, 8 December 1964, lot 9. The Property of a Gentleman; Sotheby's London, 6th April 1976, lot 41. The British Rail Pension Fund; Sotheby's London, 12th December 1989, lot 59. Literature: Christian Deydier/Oriental Bronzes Ltd., Twentieth Anniversary, Paris, 2000, no. 14. Exhibited: London, Victoria & Albert Museum, 1977-1985. Dallas, The Dallas Museum of Art, 1985-1988. Paris, Christian Deydier/Oriental Bronzes Ltd., Twentieth Anniversary, September-November 2000. 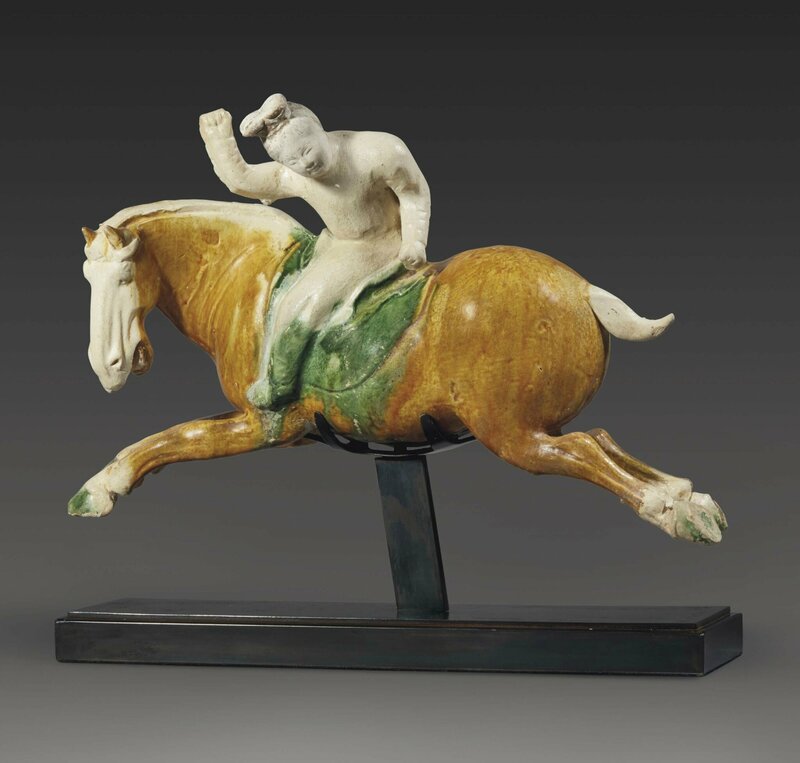 Amongst the most dynamic ceramic sculptures ever produced in China are those from the Tang dynasty, which, like the current example, depict polo players riding at full gallop and stretching out from the saddle to swing their mallets. The powerful sense of movement of the horse and the athletic balance of the rider are perfectly captured by the ceramic artist. The horse’s legs are extended front and back, in a movement known as ventre à terre, which emphasizes the impression of speed, while the rider twists from the waist with arm raised to strike the ball. The horse has long made a significant contribution to life in China and to the present day remains an important part of the lives of those inhabiting China’s northern steppes. It is thought that the domestication of the horse in China began in the Neolithic period, and it is from this time that the earliest artistic representations of horses have been found. Horses are shown in considerable variety and number among cave paintings dating to both the Neolithic and the Bronze Age from Inner Mongolia and Gansu province, while stone carvings showing life-like horses have been found at Bronze Age sites at Bayan Urad, Dengkou County, Inner Mongolia. At the same site a carving showing a man riding a horse has been found (illustrated by University Museum and Art Gallery, Hong Kong in Heavenly Horses, Hermès, Hong Kong, 1997, nos. 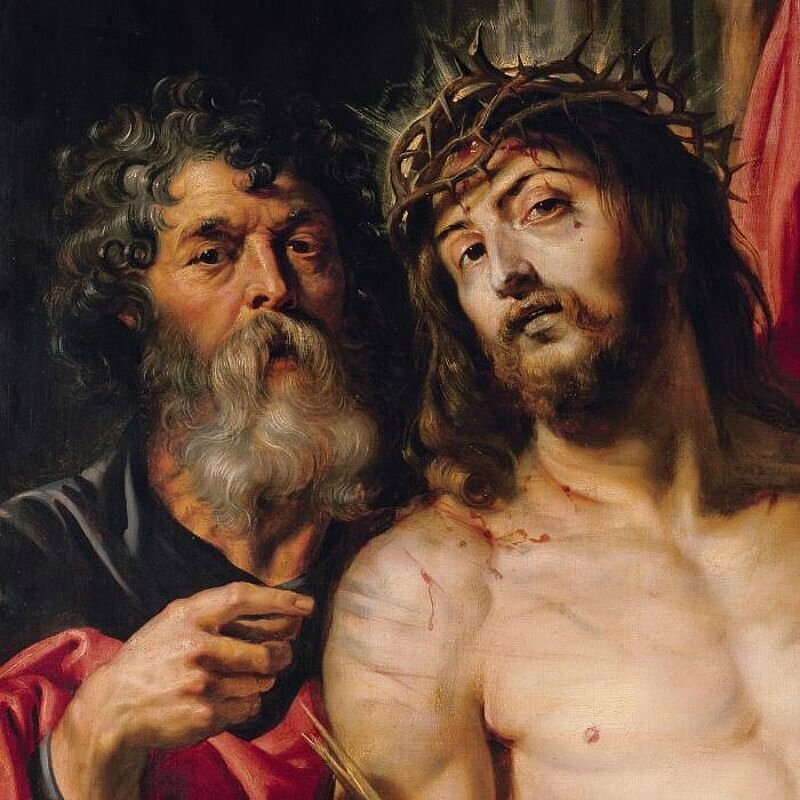 4-6). From this time onward there developed a spiritual and artistic fascination with horses in China. Horses were valued, not only as animals which could be ridden, but as dray animals and, perhaps most importantly, as creatures of war. The use of horses to draw war chariots and as steeds for cavalry proved crucial in China’s internal and external conflicts. The Chinese belief in the afterlife and the concern with providing the deceased with those items essential for his or her well-being in the world after death has ensured that abundant evidence has been preserved attesting to the importance of the horse in ancient China. The royal tombs of the Shang dynasty (c. 1600-1100 BC) at Xibeigang include burials of real horses, chariots and charioteers, all of whom were interred with their masters in order to serve them in the afterlife. This gruesome practice was replaced in later periods by the interment of models in clay, wood or bronze. The most famous excavation of such models is undoubtedly the huge ceramic army made to accompany the First Emperor of China (Qin Shihuang) to the grave in the third century BC. This army, found in Lintong County near Xi’an in Shaanxi province, included life-size soldiers and horses, all carefully modelled and painted. The First Emperor was also provided with bronze chariots. Although these are only three-quarter size, the imperial chariots, horses and charioteers are masterpieces of the metalworker’s craft, showing every tiny detail including that of the harnesses (see Li Xixing (ed. ), The Shaanxi Bronzes, Shaanxi People’s Fine Arts Publishing House, Xi’an, 1994, pp. 330-2). The horse depicted in the current ceramic sculpture therefore represents the results of a carefully managed imperial breeding programme. 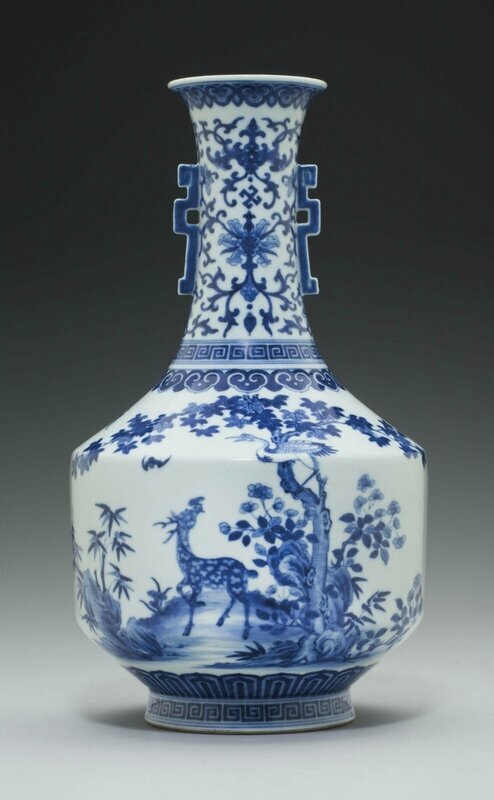 The Han and Tang periods were both characterized by major artistic achievements and among the visual arts of both periods, depictions of horses provide some of the finest examples. During the Han dynasty large unglazed pottery horses were made in the south west of China in Sichuan province. Smaller wooden or ceramic horses were often painted with cold pigments, while bronze horses, such as the so-called ‘flying horse’ found in 1969 near the city of Wuwei in Gansu province, brought horse sculpture to a new level. However, the most universally admired ceramic horses are those, like the current example, which were made for the tombs of the Tang dynasty elite. These horses, representing wealth and power, played a significant part in emphasising the importance of the occupant of the tomb. These were not just war horses or horses used for transport, but were also horses ridden for leisure pursuits – most importantly hunting and polo. The ceramic horses of the Tang dynasty were either decorated with sancai (three-colour) glazes or were unglazed and cold-painted. Both techniques were extremely successful, but the sancai glazes, seen on the current figure, produced brilliant, lasting colours, emphasizing the horses’ powerful bodies. The horses depicted, as noted above, combine power and agility - qualities which are brought out by the ceramic artist. Although a 3rd century AD poem by the Chinese poet Cao Zhi (曹植AD 192–232) mentions hitting a ball on horseback, and a mural in the circa AD 584 tomb of Xu Minxing in Shandong province depicts a man mounting a horse while holding what appears to be polo sticks, the first clear written evidence of polo in China dates to the Tang dynasty, when the game was referred to as jiqiu (擊球 strike ball). Today the game is more usually referred to as maqiu (馬球 horse ball) or damaqiu (打馬球strike horse ball). Polo was a particularly popular activity at the Tang court and was played by both men and women. The rider on the current horse is female. Polo was specifically encouraged by two Tang emperors, Taizong (r. AD 626-649) and Xuanzong (r. AD 712-56). It was not only seen as an exciting game, but as being excellent for the development of certain useful skills, which, in the case of the young men of the court, could be applied to military activities. It is significant that a spirited polo match, involving more than 20 horsemen, is depicted in a mural on one side of the entrance tunnel to the tomb of Li Xian Crown Prince Zhanghuai, dated circa AD 706 (see The Silk Road- Treasures of Tang China, The Empress Place Museum, Singapore, 1991, p. 74). (Fig 1) Zhanghuai was ordered to commit suicide by his mother Empress Wu Zetian in AD 684, but after his brother Zhongzong came to the throne in AD 705, Zhanghuai was reinterred at the Qianling Mausoleum northwest of the capital Xi’an in AD 706 with full honours. The mural in his tomb shows the players using stirrups, which is not always the case for Tang equestrians, but which can clearly be seen on the current ceramic figure. More significantly, the mural’s appearance in this royal tomb is indicative of the importance of polo at the Tang court of the early 8th century. Polo was even the subject of poetry in the Tang dynasty, and such a poem by the literatus Han Yu (韓愈 AD 768-824), is entitled Poem to Commander Zhang at the meeting of the Bian and Si Rivers. The poem describes a smooth polo field, one thousand steps in length, with low walls on three sides, and refers to the ball as ‘the divine bead’. In the poem, the game takes place before sunrise on a cold autumn morning, and drums are sounded when the red flags are raised to signal the beginning of the match. The poem goes on to describe the fierce contest between the players and the excitement of the onlookers. It ends by pointing out that this is not a game for fun, but is military training, and finally notes the scarcity of loyal officers and suggests that they are kept for fighting real enemies. However, even scholars played polo in the Tang dynasty and in the latter years of the dynasty it was customary for the successful candidates in the national civil service examinations to host a polo tournament in celebration. Records indicate that in AD 877 a team of scholars even beat a military team, to the chagrin of the latter. It is reported in several texts that during the reign of Zhongzong (r. AD 705-10), on the occasion of a marriage between a Chinese princess and a Tibetan king in AD 709, the Tibetans challenged the Chinese to a game of polo in the palace grounds. The emperor took up the challenge and a four-man Chinese royal team, comprising one of his nephews, who was to be the future Emperor Xuanzong (r. AD 712-56), two of the emperor’s sons and another nephew, defeated the ten-man Tibetan team. Indeed, historical texts praise the skill of the future Emperor Xuanzong. As mentioned above, the polo player in the current ceramic sculpture is female, and it is noteworthy that in the Tang dynasty women enjoyed much greater freedom than they would in later dynasties. Nevertheless, as in the Han dynasty, the riding of horses during the Tang dynasty was restricted by an imperial edict of AD 667 to military personnel and court officials. In the early Tang period, women generally travelled in small carriages pulled by oxen, but by the middle of the dynasty they also rode horses – riding astride, wearing western-style clothing with fitted jacket, accompanied by a wide-brimmed hat with a veil. This head-gear was, unsurprisingly, discarded when they played polo, and was generally omitted from their outfits later in the dynasty. Indeed, when playing polo, the dress of women was essentially similar to that of men. Women from among the Tang elite must have played polo on a regular basis, and are depicted not only in ceramic sculptures, but also on bronze mirrors of the period, where their long, hooked polo sticks can clearly be seen. As the sticks of ceramic figures would have been made of wood, they have not survived on the majority of ceramic sculptures. Female polo players were praised by the Tang poet Wang Jian (王建 c. AD 767–830). Wang particularly noted their skill in executing backhand shots, which is what the female rider in the current piece appears to be doing. While it is not certain, records appear to suggest that in the Tang dynasty male and female players did not play on the same team. In fact, it seems that court ladies only played with the emperor, relatives, and certain other approved male members of the court. However, it is probable that some mixed games would have taken place. Models of horses such as this one, representing as they did wealth and power, played a significant part in emphasising the importance of the occupant of the tomb in which they were placed. The current model is not only extremely rare amongst sancai figures both for the powerful and dramatic stance of the horse, but also for the agile grace of its female rider.